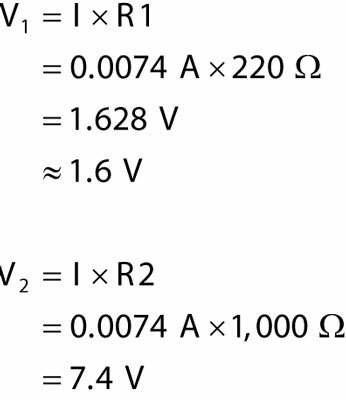 To figure out how much voltage is dropped across each resistor, you use Ohm’s Law for each individual resistor. You know the value of each resistor, and you know the current flowing through each resistor. Remember that current (I) is the battery voltage (9 V) divided by the total resistance (R1 + R2), or approximately 7.4 mA. Note that if you add the voltage drops across the two resistors, you get 9 volts, which is the total voltage supplied by the battery. That isn’t a coincidence; the battery is supplying voltage to the two resistors in the circuit, and the supply voltage is divided between the resistors proportionally, according to the values of the resistors. This type of circuit is known as a voltage divider. 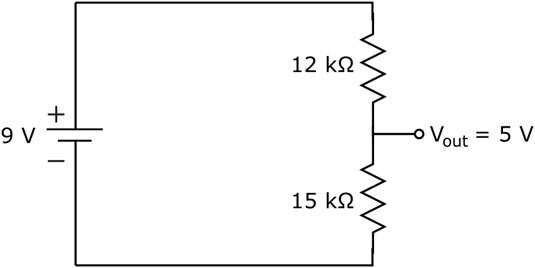 Use this image to calculate the divided voltages. By plugging in the values of R1, R2, and Vbattery, you get V1 = 1.628 V and V2 = 7.4 V, just as calculated. Many electronic systems use voltage dividers to bring down a supply voltage to a lower level, after which they feed that reduced voltage into the input of another part of the overall system that requires that lower voltage. The circuit in the following figure divides a 9 V supply down to 5 V.
This voltage divider circuit reduces the 9-volt supply to 5 volts at Vout.